No early start for us this morning--we were a little bit lazy and slept in till 6:30! The bed here is heavenly--the first good bed we’ve had in 3 weeks. We had breakfast at our guesthouse, they put out a pretty nice spread. Remembering how cold we were yesterday we bundled up before we left to walk to the subway. By the time we got to our destination I’d already shed one layer, thankfully it was much warmer here today. Our first trip on the Beijing Subway system was a nice surprise. Yes it’s crowded, but everyone is polite, and I was even offered a seat by a nice young lady. We made a quick line change, getting off at the Tiananmen Square location--our first stop of the day. Tiananmen Square is an interesting place. There is massive security in place, and to get into the square you must go through an airport like security check, all bags go through a scanner. There is a huge police and military presence. I noticed a small group of 10 or so Chinese posing for a photo--they looked like a group of runners, possibly. They started to unroll a small banner (maybe their club name??) to hold up for the photo. Before they could even get it unrolled, the police and military were right there to stop them--NO banners or posters allowed. It was all very quick, but there was no doubt that the guards were very serious! There were also thousands of other tourists--99.9% Chinese. 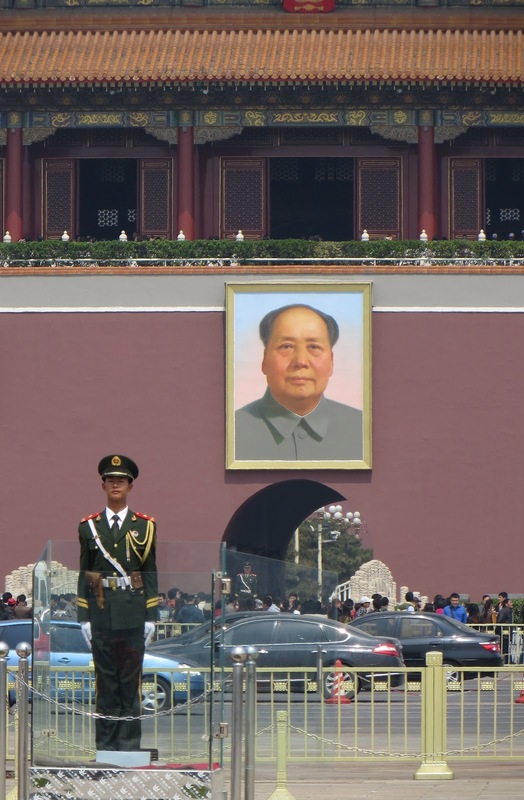 Everyone was taking pictures in front of the large portrait of Chairman Mao. The line to get into the mausoleum (where one can still view the body of Chairman Mao lying in state) was very long. We walked towards the Forbidden City and turned down an interesting looking street. There were many high end shops--nothing of interest to us. We walked down another street and came across a street market--what a fun scene! There were lots of food vendors and souvenir sellers, and we shared a small snack of grilled corn on the cob. We wound our way out of the food market, not finding much else we’d eat. 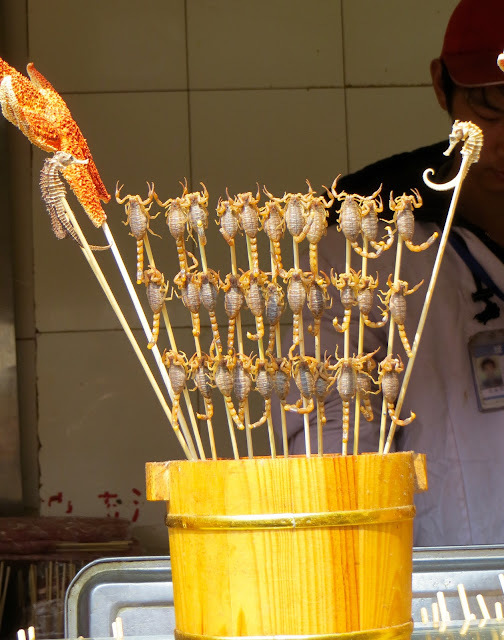 I did find skewers of live scorpions at a couple of food stalls--still wiggling on the skewers! I think they are deep fried before they are eaten, at least I HOPE they are, because I promised my favorite neighbor Nathan that I’d eat bugs for him! I might have to work up to it, Nathan--we still have 8 more days here!! We decided we were ready for lunch, and found a small dim sum restaurant and ordered a steamer basket of 7 assorted steamed dumplings to share. Some were OK, but others I couldn’t quite eat! After our very small lunch/snack we continued exploring that area, thinking we might find the hotel we will be staying in next week. It is very near this area, but we never found it. We did explore a couple of small hutongs. 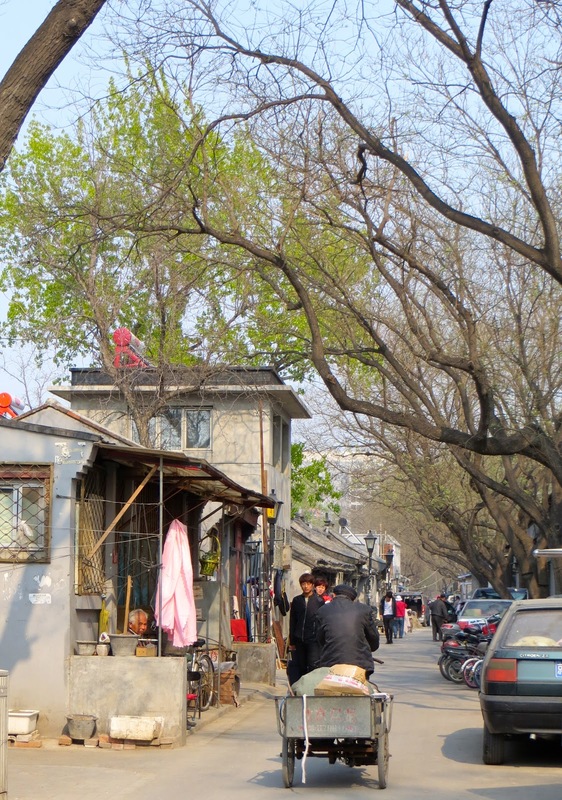 A hutong is a series of lanes or alleys between rows of small attached houses that are built around a central courtyard. They were common in earlier times, but are now being demolished and replaced by high-rise buildings. Food street--lots of food vendors and stalls. After a little hutong exploring we got back on the subway and headed to another area of town. We wanted to try a small brew-pub I’d read about, and with my printed out directions from their website, we easily found it--down another hutong alley way! We each had a beer and shared a small appetizer plate and enjoyed visiting with the manager, a nice guy originally from Washington, DC. On our way out of the hutong, we heard a cherry little “Hello” and turned to see the cutest little boy--maybe about 8 years old. We stopped to say hello back, and he sweetly asked me my name--all of this in English! I told him my name and asked his name; he thought for a minute and then said “My name is Tom”. I think he had to try hard to remember what his name was in English! We shook hands and he said “nice to meet you”--what a sweet little conversation! Of course, we complimented his fine English skills! We walked a few short blocks to the subway and made our way back to our guesthouse where we relaxed for a couple of hours. We decided to go back out to pick up some bottle water and have a late dinner. We didn’t feel like going far, so chose a small place very near. It was quite busy, but we got a table and the young waitress brought us menus. Uh oh--no English menu! We looked at some of the pictures, and then brought out our iPhone to use our Chinese character translation app, wanting to make sure we weren’t ordering dog meat, pig intestines or such. That thoroughly confused the waitress! A very nice young lady sitting nearby overheard our conversation, and came over to our table to ask if we’d like some help ordering. Of course, we gratefully accepted her kind offer! She so sweetly helped us order, and we had a very good meal of shredded pork, fried rice and steamed lettuce. We thanked her profusely! After stopping for bottled water, we walked along the street next to ours where a night market was set up. A few food vendors, but mostly shoes, clothing and accesories. Didn’t buy a thing, but the people watching was good! All in all, it was a nice relaxing day in Beijing. We’re not sure what we’re going to do tomorrow--but I’m sure it will entail much walking and many stairs up and down to the subway!